Draw a line from each word in the left column to the picture that matches it in the right column. 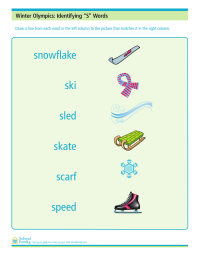 Includes Winter Olympics-themed words. 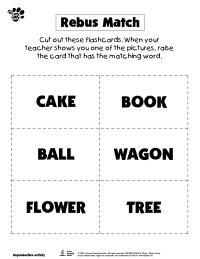 Cut out these flashcards and raise the card that has the matching word. Provided by Simon and Schuster Resources where you can find Blue's Clues books. Draw a line to connect each word on the right with the picture that matches. 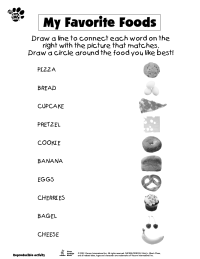 Draw a circle around the food you like best! Provided by Simon and Schuster Resources where you can find Blue's Clues books. 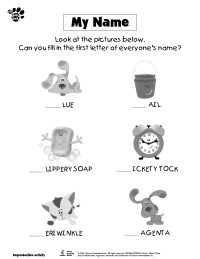 Look at the pictures and fill in the first letter of each Blue's Clues character's name. Provided by Simon and Schuster Resources where you can find Blue's Clues books. Make your own book with this printable. Storyline teaches children about good handwashing techniques. Provided by NSF's Scrub Club.